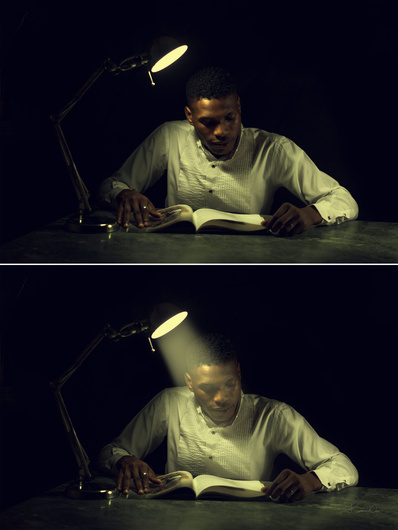 Most times less is always more, i had to add ray of light to give this image more life. The ray was added in photoshop with with some gaussian and motion blur filter. I actually really like the image w/out the faux rays added. Did you experiment with selectively opening up some shadows on the right side of his face (like around the lips and chin and a hint more on his left cheekbone in the small spot just below his left eye). With the light ray I keep looking primarily at the semi opaque ray of light. With the original photo I'm looking around the full picture. But it's great to experiment and figure out what you prefer (and want to convey) for yourself!